Shimejis are little characters (desktop buddies or mascots) who play around in your windows of Google Chrome (web browser) or Chrome OS, while you are browsing the internet. 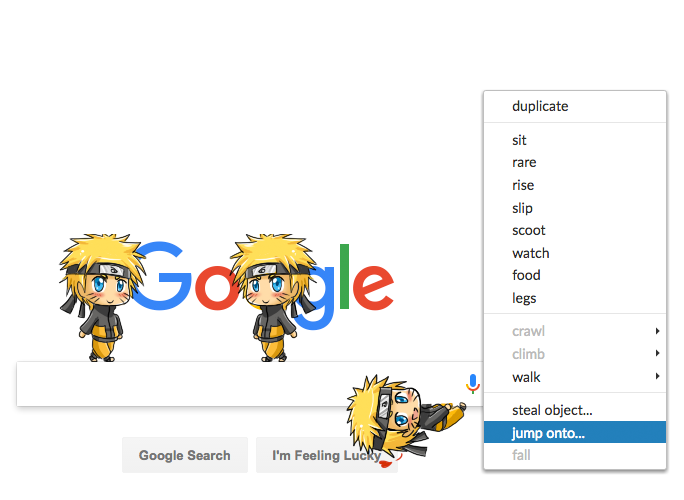 Pick up a shimeji with the mouse pointer, drag them around, and drop them where you want. They walk, crawl, and climb all over your screen and interact with elements on web pages. They can play on almost every site including Google, YouTube, Facebook, DeviantArt, MyAnimeList, Pinterest, Tumblr, and Instagram. There are shimeji buddies of many popular anime series, games, movies, animations, etc. available for download in the shimeji directory. Choose your own favorite character with its unique behavior, created by artists/creators from all over the world. Open the shimeji directory to pick a shimeji.